Four hand trucks are placed side by side at the same distance from each other in rows of two in front of a wall. The first row stands at a distance of 10 m from the wall. The second row is 5 m behind the first row. On each hand truck a compressed air cylinder is placed upside down. The compressed air cylinders are filled with 300 bars. A pressure gauge is screwed on the compressed air cylinders. Eight target circles are hung in two rows on the wall in front of the hand trucks. The bottom row is mounted at a height of 2 m. The higher one is arranged at a height of 6 m. Behind the hand trucks are four pallet cages each with nine compressed air cylinders. Next to each hand truck is a candle on the ground. A hemp cord, fastened to the ground with a hook, is set up in front of each candle. The cord is guided 40 cm above the candles to a hook on the ceiling, and then down to 3 m above the manometers. Hanging from the end of each hemp cord is an anvil, which is aligned exactly above the manometer. The candles are ignited simultaneously. After an indefinite period of time, a hemp cord is burned through and the anvil falls onto a manometer. The manometer breaks off and the bottle’s contents escape suddenly. 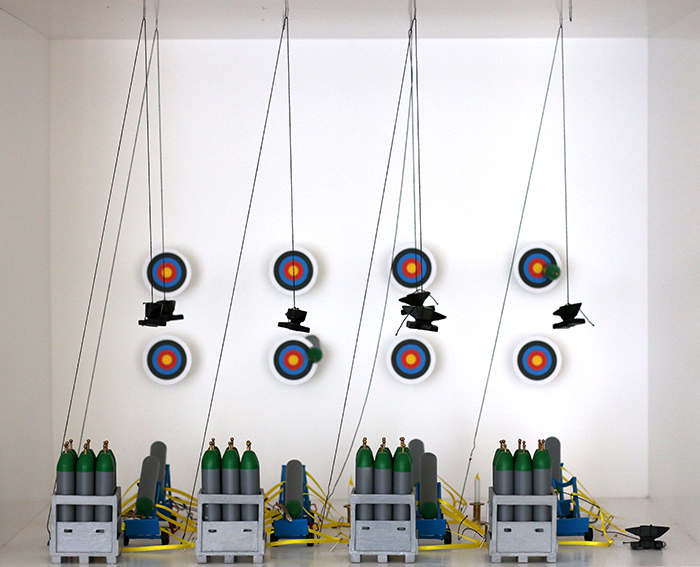 The compressed air cylinders fly towards their targets on the wall. They'll probably penetrate the targets and smash into the wall.